I’m glad you enjoyed it! And thank you for the luck! That’s absolutely horrendous! I had no idea that people could actually say such things… *shakes head* I completely agree with your arguments (were they even arguments? There are really no two sides here). I thought it was horrendous. I think it’s okay to dislike things, but to say the things many people did sickened me. ANNNNNNND OMG. :] Thank you. I have a Twitter. I use it, but I prefer other websites like WordPress and Facebook. That being said, it’s fun to get on trending topic discussions (which are normally found on your left). If you want to use it for reading and writing, there are a lot of articles out there about what hashtags you can use to connect, but it’s just like everything else, connect by being yourself. Exactly! Especially when it’s unwarranted (though, that’s really all the time). Starting to think social media is taking a turn for the worse. At the very least it’s showing signs that it might not last forever. People in general won’t stay on those sites if this is what they get used for. One thing I’m still trying to figure out about the James thing. Did she actually show up and answer questions? It sounds like the thing imploded before she could make an appearance. I agree! That’s what I’m worried about. We FINALLY have a way to talk to the people who inspire us and we treat it like this? I can see more and more people leaving, especially once celebrities leave. She did respond! I only know this from the articles I read when researching how to write this article, but here’s the sad part: I could not find ONE screenshot of HER responses to interview questions at all. I could only find screenshots of people being mean to her, while the rest of the article summed up what she said–another disappointment, to me, in my opinion, because people aren’t even talking about the fact that she actually handled this very gracefully. It’s always a handful of people that ruin it for others. The lack of a screenshot is why I was unsure if she was there for any length of time. I think the media is more into the attacks, which is another massive problem. ‘If it bleeds, it leads’ is the order of the day. I wouldn’t have blamed her for staying out of it. Agreed! They do love drama–which is part of the problem and why I think we’re heading toward authors leaving social media completely. It’s not meant for drama. It’s supposed to be used to connect with fans. I think it might not be a total departure. More like authors remaining on their blogs where they have more comment control. Twitter and FB are going to take a hit though. Not only from authors too. I know a lot of people are leaving FB because it’s nothing but negativity and fighting. Yes! I see that happening a lot…which is sad, but I understand it too. I prefer WordPress where I can have meaningful discussions, including disagreements that are respectfully written. It’s harder to do that on Facebook and basically impossible to do that on Twitter. I think it’s possible with Facebook only if you do it in a ‘friends/known person’ arena. Another option is to do it in public and then block anyone causing trouble. At least I think you can block people. I know you can do that on Twitter, which is terrible thanks to the 140 character limit. Alwsys good to share wisdom! Word. Less of what you dislike, more of who you think we should be reading! Keep it on the Pos, people. Glad you liked it! I love sharing what I love to read. In fact, that’s most of my social media, and I pick my reads based on what others have shared positively. Thank you for reading and commenting. I’m not a huge fan of Twilight or 50 Shades, but I don’t hate on the authors because of that. 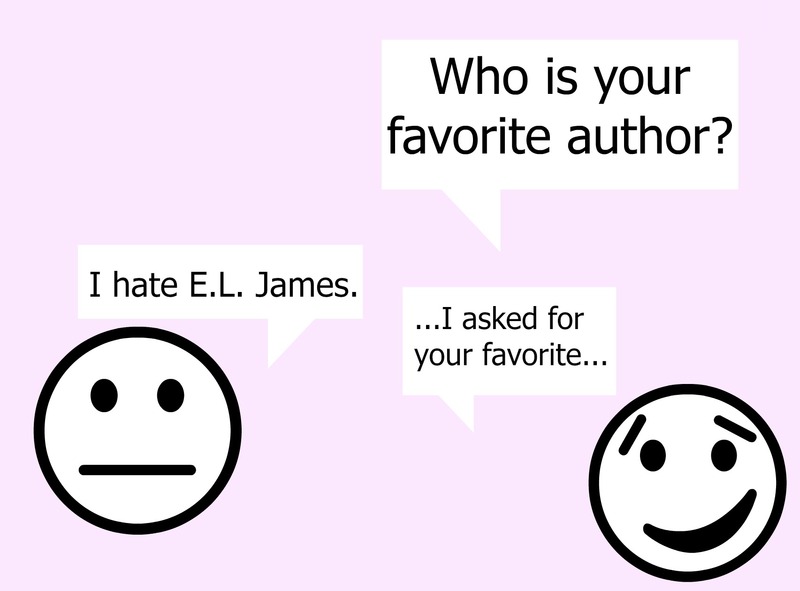 Everyone has their likes and dislikes when it comes to books. When i heard that E.L. James got crap on Twitter, I felt really bad. Not only does it hurt the author, but those people also ruined the chat for the actual fans of the series. Exactly! Agreed! I wasn’t at the actual event, but just hearing about it bothered me for the industry – readers and writers – as a whole. I was extremely sad about what happened to Cassandra Clare and John Green. I should also be sad when it happens to another human being, fan of her work or not. I didn’t hear what happened to John Green and Cassandra Clare until I read your post. It’s so sad! It’s amazing how people have so much time on their hands that they sit down and do/say these things. I don’t get it. I remember being on Twitter when the E.L. James tweet session happened. I stayed out of the tag and it was probably better that way because I saw the articles shortly thereafter. I agree with you that there needs to be a line drawn between critiquing the work and abusing/dehumanizing the author. Very well put. I was online when it happened but not on Twitter, so I saw it when the first few articles started popping up. I thought that quote was perfect too. That’s why I saved it. I found it in another article’s comments (an article that was praising the event), but I never got the name of the person who said it. I think they summed up my feelings perfectly. A good article, and a valid point, but I feel the need to raise a possibly discordant note. You compare what happened in the Q&A to someone shouting about witchcraft and the devil at a J K Rowling reading. Not a bad comparison, but there’s a crucial difference– at most public venues like a reading or a signing, security would have the heckler in hand and out the door in about twenty seconds, if they’re earning their pay. There is no bouncer on the internet. The internet is a cess-pool. To call it a jungle would be a compliment. There are some well-swept and fairly tidy zones, but for the most part it is a place where knuckle-dragging thugs go to display their stupidity and work out their petty little issues. It’s an ugly space, and getting worse, and all in the name of free speech. If the internet has become an essential tool for modern society, it needs big signs over its gateways saying, “ENTER AT YOUR OWN RISK– NOT RESPONSIBLE FOR LOSS OF VALUABLES”. I am dismayed by the abuse James received, but wholly un-surprised. What I can’t wrap my head around is how dumb her publicist had to be to subject her to this. Firing is too good for this person– a stint in Siberia seems in order, at hard labor with police dogs snapping at their heels. “The Internet can be as positive as we make it.” True enough, but unfortunately, I think you’re asking too much of people. There are always going to be some losers who gleefully ruin it for others. And with the internet there is no burly guy who can put the troll in a headlock and drag them out the door. What I come to notice is that more people “hate” authors when really they hate that other people like them and they’ve become popular. Hating fans is too hard so they focus all their energy on the leader. Welcome to being famous, here’s your hoard of trolls. Lol! The last line of your comment. Priceless. I completely agree! This hate and bashing has got to stop! If you don’t like their work, don’t read it! It seems simple to me, but people just have to point out what they perceive as inefficiencies in others. It’s one of the horrible flaws in human nature and it needs to stop.. I’m reblogging this. Reblogged this on The Voices In My Head. I’m not sure how this comment is going to be received. As a survivor of abuse who almost lost her life, I can tell you that the negative feelings ignited by 50 Shades are valid and should not be minimized in any way. Domestic violence and teen dating violence has long been out of control, and writing and movies that glorify and excuse this violence are not making it any easier to convince those being abused – those who very lives are in danger because of this – to come forward and report it so they can get away and rebuild their lives. The image it perpetuates in the mind of society is that is acceptable, even romantic, and those “complaining” about it should just be silent. Unfortunately, too many people do not channel the frustration and hurt that arises in an appropriate, considerate, or compassionate way. I feel that when someone uses a public forum hosting a Q&A, they should expect that there will be some negativity that they will deal with – especially when romanticizing a crime that has taken so many lives because the tendency is to sweep it under the carpet and look the other way. Trolls will always be trolls, and I know that’s hard to ignore, because many of us have tact and decency governing when and how we communicate with others, but we do not live in a perfect world. Now, with that said, there are right ways – positive and constructive ways – to approach issues like this, and there are demeaning, cruel, and flagrantly wrong ways to approach it. Like I said earlier, the negative feelings themselves are NOT the problem. The issue is those speaking choose to spew anger and say horrible things to someone, simply because they can get away with sitting behind their monitors and their smart phones and not have to worry about seeing how their cruelty impacts the person at which it is directed. Dehumanizing someone no matter what has been said or done IS NEVER OKAY. Choosing to publicly berate and bully someone (for example, the 50 Shades Q&A) makes those of us who use our blogs and social media to speak out against abuse in a positive way appear to be in the same lot. Do I like 50 Shades? Absolutely not, but even I know despite the negative feelings I have because of MY OWN EXPERIENCE, it does not give me the right (nor do I have the desire) to publicly shame and inflict cruelty on another human being. Because of this, I opted to stay out of and far away from the Q&A. I did not then, nor do I now, feel that it was the appropriate venue to express my own feelings. I have plenty of other opportunities to do so in a much kinder way, and that is the path I choose. I only wish that others saw it fit to do the same. I think your comment is fantastic! I agree. It’s okay to state what you think and why you think it. It’s when someone starts abusing an author, like telling them they wished they would die and their whole family would die, is where I draw a line. Thank you for reading and commenting! I dislike any form of hate and this fits into that category. Ok it’s fine to have an opinion and we all do and we should be able to voice those opinions but there is no need to be ugly and vicious about it. Thank you for this. I completely agree that the Internet is not and should not be just about spewing abuse at anyone. The situation with gamergate abusing female gamers and designers is just as bad. There’s no reason for it. If a work is really successful, but not to your taste, then as a writer all you can do is try to study it and understand why it worked… and then let go. You don’t have to review it. You don’t have to read it. You don’t have to mention it at all. Excellent points of view.Best wishes and good luck.